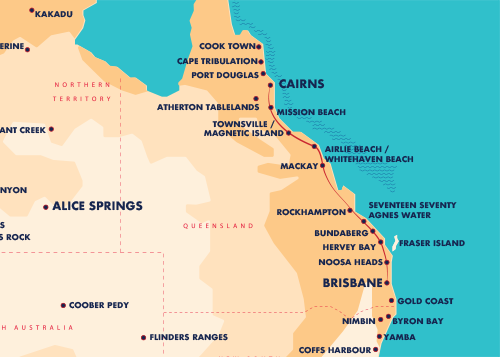 Take–off from Brisbane, Cairns or Byron Bay and enjoy 90 days of travel through Australia’s sunshine state. Stop at Hervey Bay, bask in the beauty of Fraser Island or soak up every destination in between; it’s your journey. No set itinerary means you can travel to the places you have dreamed about and choose just how long you want to stay there. Simply hop on and off any of our Coaches along the way and if you need more time, just purchase a three month extension. Don’t forget, we also throw in travel between Byron Bay and Brisbane as an extra bonus! Because, there’s no such thing as too many pristine beaches, splendid waterfalls and tropical rainforests to explore. Once purchased, simply create your own personal My Greyhound account. From there you’ll have 24/7 access to book your seat on any one of our coaches in real-time. And if you need an extension little longer, you can add another 90 days by purchasing an upgrade - at any time during travel.